Everyone's pretty friendly here and you'll find a lot of people who share your interests. If you don't mind me asking, what MMOs do you play? I'm alternating between FFXIV and WoW right now. I sometimes play ESO and Lord of the Rings Online on and off. I used to play EVE, but it got too stressful and I had to stop. I used to play ESO a lot. I like how they were really dedicated to making it near impossible to hinder another person's gameplay. Like, no ninja looting, no team kills or betraying, no kill stealing... basically the only trolling is in the chat which you can turn off. Welcome to the forums, HylianMadness! 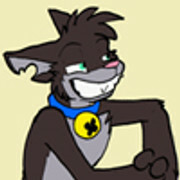 so, is anybody else picturing peanut enthusiastically barking the text of every post because of that avatar? Welcome here, HylianMadness, it's cool to have another new reader. Hello, HylianMadness! Welcome to the forums. Hope you'll have a great time here. If you have any questions, please don't hesitate to ask. Greetings everybody. I figured I should post here for initiation. I started reading Housepets! on January 6 2018. When I had a question about a comic I would go to the forums to see what was said about it. Eventually, I caved and made an account so I could join in. For those who don't recognize him, my avatar is Wallace, 8th gym leader of Pokémon Ruby/Sapphire and Champion of the Elite Four in Pokémon Emerald. he's an awesome and extravagant character, though don't expect me to role-play as him. when I post on these forums, I'm being myself. Welcome! I've seen you around. I'm glad you decided to join our little comunity! Welcome to the forums, Wallace! Another new reader. Hello and welcome here, Champion Wallace! Hello Wallace, welcome to the forums. Hope you'll have a lot of fun here. Welcome, Madness and Wallace! It's great to have you both! Do feel free to ask if we mods can do anything to make your stay more enjoyable! Oh, hey guys. It's been quite a while, I disappeared way back in 2013, back when I was younger, crazier, and also a lot more active. I rediscovered Housepets! when I was hanging out with a friend of mine, while we were playing a game of Starfinder at our local gaming cafe. After the game was over our conversation turned to webcomics, and he asked "Hey man, have you read that Webcomic called Housepets?" Now color me surprised because I haven't heard that name in years, YEARS! I didn't even know the comic was still going! He pulled up his laptop and we spent at least a few hours reading some of it, and I was immediately hooked again. I binged the comic for the next few days, going down memory lane and all that jazz. Then I remembered that the comic had forums. Then I remembered I had an account on those forums. You can imagine the amount of nostalgia and embarrassment I am feeling as I look over all of my old posts. I'm not sure if this is the right forum, since it's a "Welcome Thread" and not a "Welcome Back Thread" but it doesn't hurt try, right? Thanks guys. Welcome back to the forums, snakebug! Welcome back, Snakebug! Nice to have you back. I'm the newbie of the forums now, I guess. Started reading Housepets! a few months ago and, strangely enough, it gave me some weird form of purpose. Like, I HAD to see how these arcs were going to end. This comic, and a few of Rick's other works, actually inspired me to start drawing again, right when I had no clue what I wanted to do with my life, even though my drawings are total crap. This comic has a very good community, which I was sort of surprised by. Also, snakebug, welcome back, good sir. Welcome to the forums, SilverFox! Welcome SilverFox! If you didn't already know there is an art thread where you can post your art and get feedback on it if you wouldn't mind sharing it with others! I would suggest checking it out a bit if you're trying to grow! Even if you don't, I'm sure you'll have a great time here anyways! That sounds amazing. Welcome here, TheSilverFox51! Glad to see some new faces this year! Welcome! Welcome to the forums, SilverFox! Have a great time here. Hi AldyBilly, welcome to the forums! ....and it's a very welcoming bunch of fans, too. Greetings. Have't been online for a while here but I will return to work on Kingkaiger on April 1st onward. I may not have the pilot movie finished but I think I could make a "Beta 2" work as I continue work on my classes and the many adventures of the "Pirate Squadron Power Rangers Kingkaigers." I would like to welcome you all here to the forums. Hope you enjoy your stay. And I'm sorry if I neglected my projects. Great to have you back James! Did you know that there's another forum thread for announcing when you're leaving and when you've come back? It might be useful if you want to let people know that you might be gone for a while! It's here if you want to check it out!